The concept of Six -Sigma quality evolved Motorola Corporation USA in late 70's. Mikel J. Hary , introduced the concept of Six Sigma to Motorola. It based on statistics. Its evolution was the result of Bob Galvin's expectations the CEO of Motorola Corporation in 1981 in order to effect a tenfold improvement in product failure levels over a 5 year period. 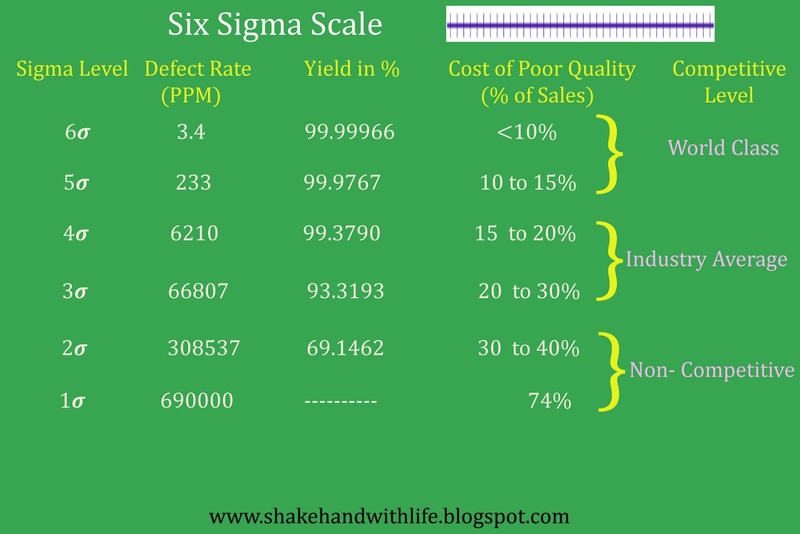 Bill Smith, an engineer of company, who is now called father of Six- Sigma conducted a statistical correlation between life of the product and the defect detected during the manufacturing of the product. He conducted that if a product has been found defective and corrected during the production process , chances were high that other defects had been missed and would show up later during usage. Mikel J. Hary suggested that breaking down and studying processes is a key element of result oriented quality programmes. This helps in tracking down the root cause of defects. Hence Six Sigma was evolved by Bill Smith and Mikel J.Hary as a 6 Step methodology with focus on defect reduction and improvement in yield through statistics. Untill 1994 , Six Sigma remains within the boundary of Motorola. Motorola reported $16 billion saving in 10 years of implementation of Six Sigma. Outer world know about Six Sigma but not how to implement it. Now it has adopted by approx. more 50% organization in the world. Each value in the group has certain distance from the mean value. This distance is called the deviation of the value from its mean. 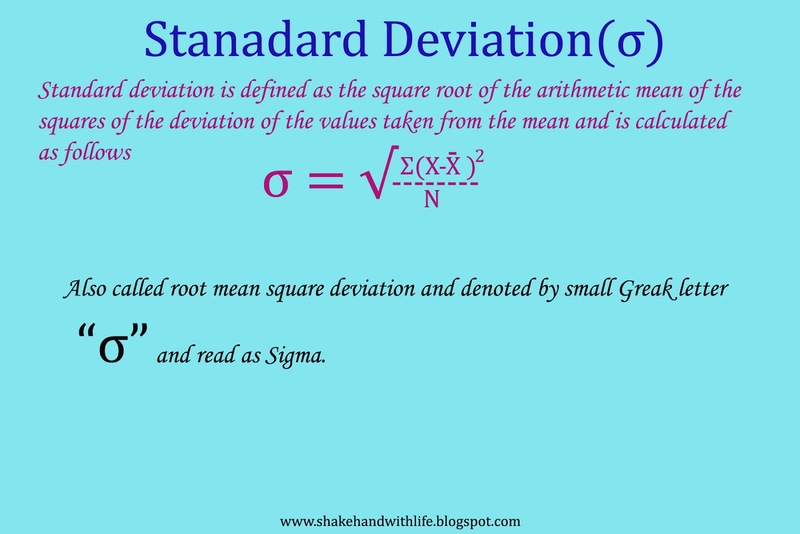 When we calculate the deviation for the whole group we call it Standard Deviation or Sigma. 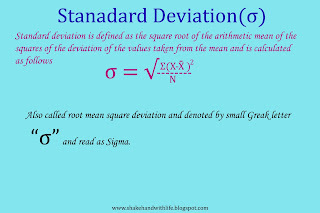 Hence Sigma represent the Standard Deviation which is used to measure the spread of any process from its mean value. If the value of Sigma increases this means the deviation of the process from the mean value increases. Therefore the value of Sigma must be as low as possible. Why Six Sigma found places so quickly? 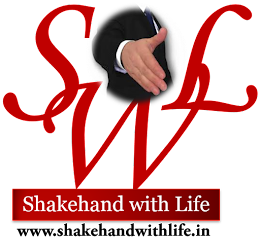 After open to the world Six-Sigma fixed its place very quickly. It has a strong reason which shown in the Six Sigma scale. Some of them are mentioned below. It makes the organization more competitive. It increases the customer satisfaction. It reduces the defect occurrences. 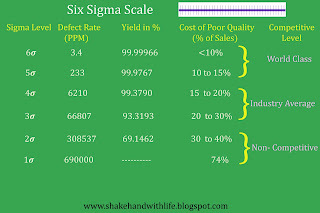 Above all Six Sigma counted the defect in number per million rather in percentage. I would like to clear it by this example. Suppose Vendor A and Vendor B offer to supply the cap of a pen to a pen manufacturing company Say 'C'. Vendor A commit that the Lot of Caps he will send has 99.3790% pcs OK and Vendor B commit that the lot he will send has 99.9767 % pcs OK but he will charge little more than the Vendor A. Which Vendor will be selected by the Manufacturer C? If cost is taken into consideration then Vendor A will be selected because in terms of OK percentage it is very small difference but on the basis of Six Sigma Vendor A supplying 6210 defective pcs per million and working at 4Sigma level while Vendor B supplying 233 defective pcs per million and working on 5 Sigma level. So the difference of defective pcs are very high but it is not reflected in percentage scale and for every defective pc of Cap the pen manufacturer has to bear the cost of defective pen which in turn will go very high. So on the basis of Six Sigma Scale the Manufacturer should select the Vendor B. This will certainly save the cost and reduce the customer complaints of the manufacturer and return a high profit margin and goodwill. "In layman language , Six Sigma is 3.4 defects per million i.e. if an organization produces 1 million of its products and 3.4 pcs are found defective out of 1 million then the organization follows the 6 Sigma standard, 3.4 defects per million is the indicator of Six Sigma standard." Six Sigma is a statistical measurement , which helps us establish our course and gauge our pace in the race for total customer satisfaction.It tells us how good our products, services and processes really are. It allows us to draw comparisons with other similar or dissimilar products, services and processes. We can see where we need to go and what we must do to get there. It is a business strategy which makes the customers more satisfied. 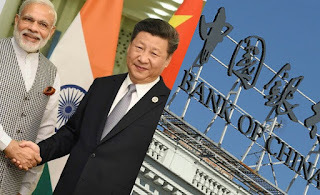 It can greatly help us to gain competitive edge. This is because, as we improve the sigma rating of the process, the product quality improves and costs go down. It is a philosophy. It is an outlook, a way that we perceive and work within the business world around us. Essentially, the philosophy is one of working smarter, not harder. This translate to making fewer and fewer mistakes in everything we do.......from the way we manufacture products to the way we fill out a purchase order. As we discover and neutralize harmful sources of variation , our sigma rating goes up. Again this means our process capability improves and the defects (mistakes) go away. Six Sigma is a disciplined Quality Improvement methodology that focuses om moving every process that touches the customers --every product and service--towards near perfect quality. It is measure of the company's quality. 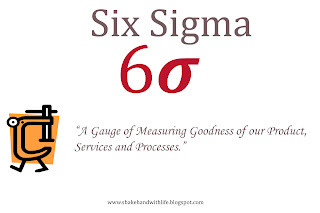 Six Sigma is more than a quantitative statistical measure of processes; it embraces every aspect of work, using a disciplined, fact based approach to problem--solving. It is a new way of thinking about work and customer value. It is also a powerful force to create one corporate culture, some of it is bureaucracy busting -pushing down decision -making to lowest practical levels, empowering employees. At the other end i.e. more complicated challenges-including lean manufacturing initiatives and variability reduction. -Anxious to move quickly to good Idea. 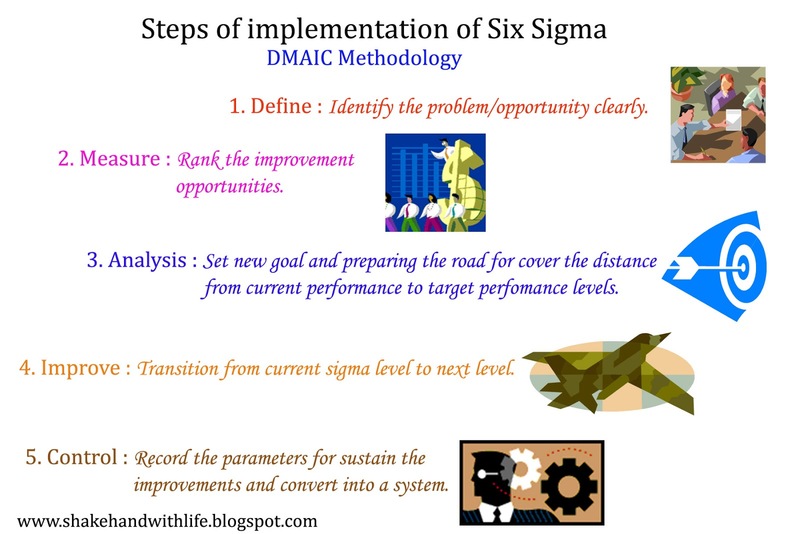 DMAIC methodology is the way through which the Six Sigma project progress. 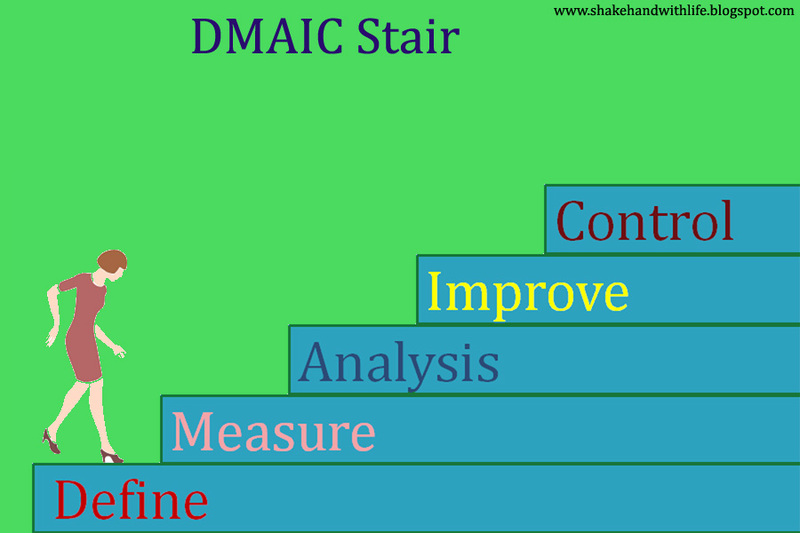 All steps of DMAIC methodology is explained briefly as below. Define: Define is the first step in which the problem/opportunity is clearly identified. If the problem is solved or get rid then how much benefit to the organization in terms of profit margin or cost saving? Measure: The second step is ranking of opportunities on basis of risk priority i.e impact and effort. Analysis: This is the step at which new goals are set and the road are prepared for cover the distance from the current level to the target level. Statistical tools as well as conventional quality techniques like Brainstorming, Root -cause Analysis , Fishbone Diagram , Pareto analysis etc. may be used for carrying out the analysis. 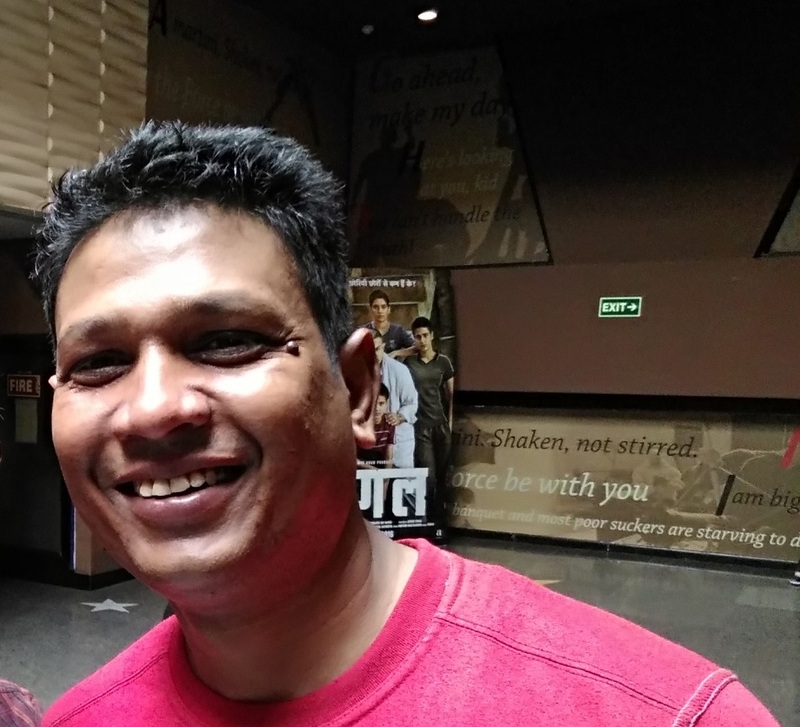 Improvement: At this step we measure how much we improve from our current sigma level and how much we have to improve to achieve the desired level. Control: This is the last step here we record all improvements and parameters otherwise we lost the control over the target achievement and go back to previous stage. So control means document the all parameters and make it as a new system. 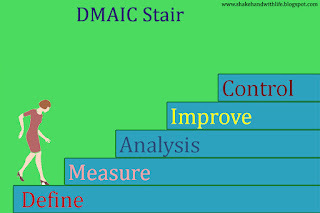 The below fig shows all the steps of DMAIC Methodology. I tried to give best explanation and if anything can be added to this then comments are most welcome. Nice blog thanks for the information. Nice and comprehensive article on the use of six sigma in process improvement. I have been researching for a while now, to update my self with new process improvement techniques as I start using a Six Sigma Certification tool to improve business processes. Sigma s the on type of the measuring scale for product and quality.